The universe was on Raidou’s side. Genma was in the first place he checked — working by the lamplight glow in Team Six’s windowless office. As soon as Raidou opened the door, Genma’s head came up. He turned from his desk, one eyebrow quirking up in anticipation of a question, and stopped dead when he saw Raidou. His mouth opened. The senbon between his teeth wavered. It had only been four days, but it was an actual, physical relief to set eyes on the lieutenant. Like the moment a chokehold relaxed and there was air again. There was a pair of crutches leaning against the desk; Genma reached for them, clearly intending to stand, but kept his seat when Raidou waved him back down. “I’m fine,” Genma said. “How are you doing?” He shot a look at the open door. “Can we…?” Quick fingers darted through the hand-sign for talk, meaning, Can we talk freely? Genma’s shoulders slumped nonetheless, but he still looked better than the last time Raidou had seen him. Since the last time had involved a hospital bed, the bar wasn’t high. Green-yellow bruises underscored his eyes, legacy of a healing broken nose. More ringed his throat from Iebara’s choking. He was wearing civilian clothes, a dark t-shirt with a subtle leaf design, and jeans relaxed enough to accommodate the bandaging that still obviously encircled his right thigh. His hair was twisted up and back into a loose topknot, leaving casual strands to fall around his face. There was a old and clearly much-loved hoodie folded over the back of his chair. He looked tired, pale, and stressed, but crutches meant walking and paperwork was dedication. Genma was taking care of the team, just like Raidou had asked. “Shibata?” Genma repeated, in tones of faint horror. He glanced down at Raidou’s hands, as if to check for missing fingernails. Only a week ago. It seemed like so much longer. Raidou hadn’t finished wrapping his head around that, either. “Reinstate you as captain of our team?” Genma said. Raidou nodded. Genma’s whole face brightened into the most genuine smile Raidou had ever seen him show, broad and uncomplicated and wholly pleased, as if the thought that Raidou might not pass the training hadn’t even caused a ripple. It was like tripping into unexpected sunshine. Raidou smiled back — there was no way not to — and leaned back against his desk, breathing in the air of Team Six’s office. He’d missed the damn room, even. Genma waved a hand, dismissing the problem for now. “Not sure what a substitute captain is going to do with us. Tousaki’s the only one who’s mission-fit right now. Medically, anyway.” Ryouma’s mental fitness was a measure Genma still needed to take. Raidou might be the only member of Team Six forced into trauma counseling, but he probably wasn’t the only one who could benefit from a session or two. But that, too, was a problem for later. Right now, Raidou was here, in the office, looking sharp in what were probably a newer set of jounin blues. The fabric of the trousers was still a little stiff-looking, and the deep blue-black of the turtleneck unfaded. Only his vest and hitai-ate showed their age. He was freshly shaven with no hair out of place. Clearly he’d scrubbed up for his meeting with the Hokage. His face had the relieved, weary look of a man who had crossed a trackless desert for days and finally found water. The lines creasing the corners of his eyes were just a little deeper, his mouth a little firmer set. The bruises on his cheek and jaw had paled to yellow-brown, and the scrapes were small dots of brick-colored scab. Only his hands were still bandaged, but there was no blood seeping through at the knuckles this time. And he had, as he’d said, all his fingernails. A look that just skirted the idea of relief crossed Raidou’s face as he exhaled, but he didn’t interrupt. Although to be fair, what did Genma—or anyone—really know about the director of T&I? Massively scarred war hero; brilliant interrogator; had a loyal following in his department, and the Hokage’s ear. And, evidently, a son who was Kakashi and Ryouma’s fellow rookie in ANBU. But beyond that it was rumor. The kind of rumor that made the baby-killers in ANBU seem like decent human beings. “It’s almost like he’s on our side,” said Raidou, darkly amused. In fairness to the lieutenant, it had been a very stressful month. Genma gave him an unspeakably dry look. “The bruising was already there,” Raidou defended, and dropped his shirt. And I’m really glad you’re not tortured and traumatized, went unsaid. The honorific seemed to have vanished from the end of Raidou’s name, too. It was familiar — and early, if you went by traditional standards — but Raidou had never set that particular boundary to begin with. Genma had asked, what felt like months ago, and Raidou remembered saying, Captain’s fine, Raidou’s fine, Namiashi’s fine if you want to play it up for the rookies. And then they’d gone and gotten formal anyway, because Team Six needed stricter guardrails than most, and Genma and Raidou had to set them. Now, alone, it was okay to relax a little. Raidou said nothing and let that be answer enough. “We’ll be running a mission with the new captain, more than likely,” Genma filled in. “Maybe there’s a secret lesbian captain with a lot of spare time we don’t know about,” Raidou said. Genma nodded, serious but unworried. He was so earnest Raidou couldn’t even laugh. There was a clear gleam in Genma’s whiskey-brown eyes, like he was completely prepared to run Team Six out into the desert himself, and return them tough, tanned, and ready for duty the very minute Raidou could take them back. Raidou smiled, and saved the poor man’s blushes with a subject change. “Looks like you’re working on reports,” he said, nodding at Genma’s desk. “Reports, yes.” Genma took a deep breath to clear the unexpected heat from his face. There was absolutely no explanation for the flood of emotion — of course Raidou was counting on him. As a captain should count on his lieutenant. “I was working—” his voice cracked, and he grabbed for his tea, embarrassed all over again. Raidou nodded, eyes flicking over the page. As he read down, a hint of a proud smile lurked at the corners of his mouth. She’d been his rookie a year ago. “I’d love to see your first eval of her when she was a rookie a year ago,” Genma said. Genma nodded, grimacing at the memory. Three teams scrambled after one was lost entirely on a mission that was still shrouded in secrecy. 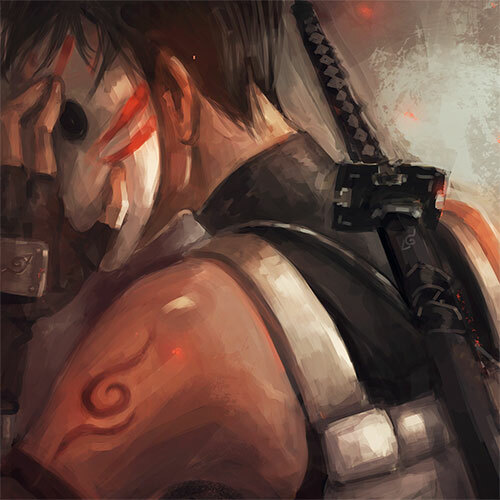 In the end, out of sixteen ANBU sent into the field, only eight came home, and only six were still serving the Hokage under the mask. “Retirement is definitely worse than getting a promotion to captain,” Genma agreed. “I won’t tell Ueno she had any role in your need for counseling, though, I think she’d take it too much to heart.” He’d meant it be light-hearted, but as soon as he said it, all he could picture was Ueno’s clone’s deeply troubled face that first night in the bunker, and picking shards of another man’s bone out of Raidou’s savaged knuckles. “I didn’t,” Genma said, grateful for the chance to climb out of the hole he’d accidentally dug for them both. “I had some ideas, but… Well, if you hadn’t gotten the no-contact ban lifted, I was going to take them to Hajime and get his opinion. He’s well enough for visitors and more to the point, he’s well enough to be bored. He told me to come to him any time, so…” It felt strangely disloyal to admit he’d been planning to seek his former captain’s advice on managing Team Six. He took a full breath, feeling his ribs expand. It was a relief having Raidou back, even if just for a brief consultation. Had it really only been a month ago that Genma’d been having to remind himself that Raidou was not Hajime, and every little way he’d become comfortable working with his captain was out the window? “Tousaki,” Genma said. He handed over Ryouma’s evaluation form and tried not to delve too deeply into empathy. It had to hurt for Raidou, watching the woman he’d mentored for a year from raw rookie to promising officer candidate be handed over to someone else just when her potential was blossoming. This is temporary, Genma reminded himself. Four weeks. Maybe six. Then Raidou will be back in command and we can put this whole fiasco behind us. Raidou’s eye had stopped moving most of the way down Ryouma’s form. He looked up at Genma with his mouth already shaping for a question. “Not so much,” Raidou said, eyes crinkling in amusement. “Since you had me at ‘make Tousaki a field medic.’” He leaned eagerly forward, all of his wistfulness washed away on a tide of enthusiasm. Why had Genma been anticipating an argument? “For this team, I’d take anything.” Raidou clenched and unclenched a fist in unconscious fervor. Given the bandages on his hands, the crutches leaning against Genma’s desk, and the stack of medical reports Genma was still working on, including follow ups from their previous mission, Raidou had a point. As always, Kakashi was the dagger-shaped peg in a round hole. Raidou took his time reading the evaluation, nodding as he went. Genma had an efficient way with the written word. Each report could be easily distilled into a basic idea. Ueno Katsuko: ready to grow. Tousaki Ryouma: talented but troubled. Hatake Kakashi: exceptional and difficult. ANBU rookies weren’t unbaked clay. They joined the ranks as jounin, with skillsets and focus already built in, every one of them capable of commanding a battlefield squad. They were the cutting edge, and only expected to get sharper. ANBU was designed to be the crucible hot enough to temper strengths, burn flaws out, and vaporize the unworthy, unwanted, or unlucky. Progression was expected, even this soon. That undoubtedly went double for Sharingan no Kakashi, who carried the dubious distinctions of ‘genius’ and ‘Hokage’s protégé’. Everyone knew he was tapped for leadership. Why else would you make him a jounin before his voice had finished breaking? Raidou had read the report of Kakashi’s first command, though. One destroyed eye, one dead Uchiha. Even with that, it had technically been a successful mission: the targeted bridge had been destroyed, and Kakashi had gotten the first transplanted bloodline in history. The Sharingan that had put his name on the map, and in the Bingo Book, and propelled Nohara Rin’s medical career off like a rocket. But underneath all that, there was still a dead young man. And there was Kakashi, who wouldn’t confer, delegate, or communicate. Who didn’t trust. “We’re expected to advance him,” Raidou said at last. “A lot of people are going to be very put out if we don’t,” Raidou said. The village had wanted a weapon from Hatake, and they’d succeeded. As far as Raidou could tell, no one had considered what to do with a thinking knife next. “We’d be risking a chidori to the chest if we tried, though,” Genma added. “Maybe you should put it in your own words,” Raidou said, amused. Genma flicked the senbon back between his teeth and picked up an actual pen to jot down a few quick lines on Kakashi’s report. At the end of each performance review there was one last empty section: “Agent Comments”. The next step was to have a one-on-one with the agent in question, or two-on-one if the captain wanted to step in. Raidou’s first captain had preferred to hold his own meetings separately. His second had liked the joint approach. Genma would have to do it alone this time around. But Raidou had already said that once: I’m counting on you, Fukuchou. It still applied. And Raidou would damn well be back in time for the next reviews. “I can’t think of anything else to cover,” he admitted. There wasn’t a lot else for them to go over, really. Genma tucked the completed reports into their folders, and stacked those neatly in the file tray on his desk before turning his full attention back to Raidou. Raidou sucked one corner of his lip in, chewing it in an unusual show of diffidence. “I should—” he began, then pulled back. “No. For now, good news and bad should come through you. Until I know exactly when I’m coming back, I’m just going to muddy the issue. They’re better off relying exclusively on you.” There was resolve in his eyes, but lurking under it, regret. It had to hurt, not knowing for sure that he would be back, no matter how much he and Genma both wanted to believe his suspension was temporary. Sometimes honesty was all you could offer a person. Raidou’s face lit right up. “I know a good okonomiyaki place,” he said. For a moment, the stress of the last mission washed away, leaving the Namiashi Raidou Genma’d met a month and change ago. The one who’d run to meet Genma the moment he found out who was going to be on Team Six, overflowing with excitement and possibilities. Raidou looked amused as he held the door for Genma. “Lead on, Taichou,” Genma said.